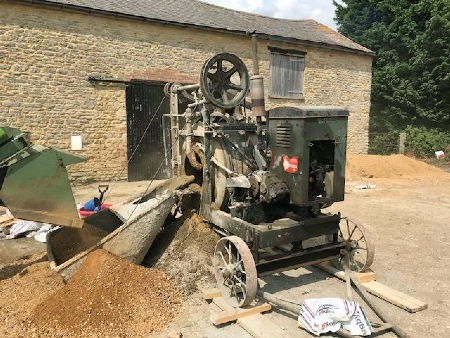 Will Needham writes: "Something different, a 1940 Rex7 mixer in action. It's been on the farm since 1947 and could have helped build runways, pill boxes etc during the war." 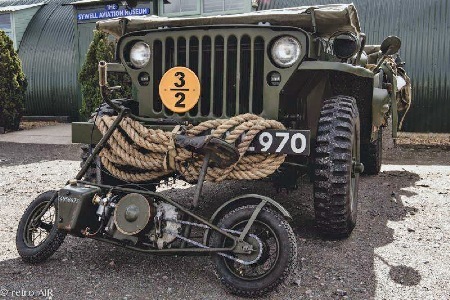 This 1942 Excelsior Mk1/2 Welbike paratrooper folding motorcycle C4658877 S/N 417 is owned by Ben Brown. who calls it Wendy. 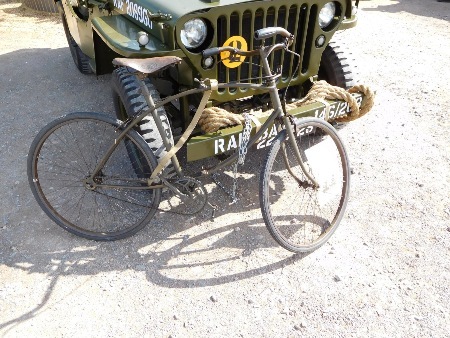 The Excelsior Welbike was an ingenious oddity that grew out of the special needs of wartime. Intended to be dropped by parachute in a CLE container or landed by glider as front line transport for Airborne Forces, the machine had to be cheap, lightweight, small and expendable. 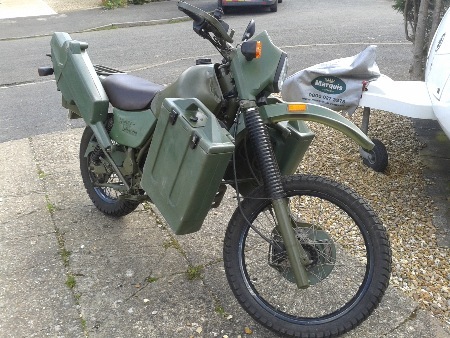 The prototype was designed by Harry Lester at the SOE military research centre Station X at Welwyn in Hertfordshire - hence the name, Wel-bike (they also designed the Wel-rod silenced pistol, Wel-man submersible canoe etc). Powered by a 98cc two-stroke Villiers autocycle engine, there was no suspension, no lights and only one brake, the bare minimum necessary. The tiny fuel tank had to be pressurized by hand pump like a tilly lamp. The tank held just under a gallon of petrol, enough for a 90 mile range and top speed of 30mph. To ready the Welbike for use, the handlebars swung up and out until they locked; the saddle pulled up and the footrests pushed down until they locked. It was ready for action in 11 seconds. 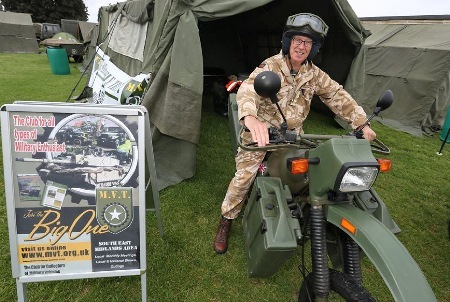 Almost 4,000 were built by the Excelsior motorcycle company in Birmingham from 1942 and they saw use by British Airborne forces and the Royal Marines. Its size meant that it proved to be a very useful airfield runabout and many were "squirelled away" by RAF personnel if they could find one! After the war some were sold off, although, without a front brake or lights they were not road-legal. Meanwhile, the original designer had been developing a civilian version, which was built and sold as the Brockhouse Corgi. It soon proved too slow and unrefined and was discontinued - although the concept returned with the folding Honda monkey bikes of the 1960s and 70s. Now very rare there are believed to be less than 200 extant worldwide. Meanwhile Excelsior continued production of their own autocycle and later built a popular two-stroke 250cc twin, the Talisman. The firm survives today as the makers of Britax accessories. This example is a MK1 version, produced in around August 1942. As such it was one of the first 400 made. It was later returned to the factory and upgraded to Mk2 status. It is very original and having been found in a barn in 2016 has been restored to running order by its current custodian and can often be found at her second home, Sywell Aviation Museum. 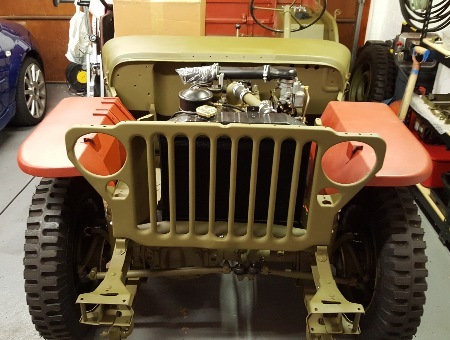 Andy's Speechley's 1943 M3A1 Scout Car was previously in a museum in Stuttgart, Germany, and will now be restored to wartime condition. This 1983 Land Rover Series III Lightweight is owned by Peter Clarke. 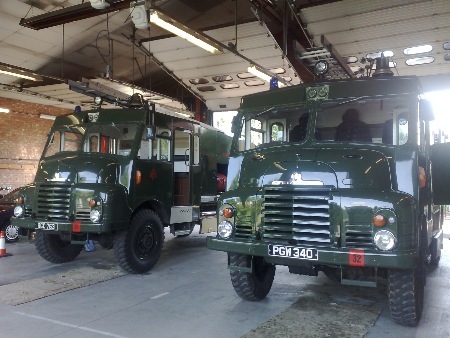 Army designation: Truck Utility Half-ton 4x4 Rover Series Three. Army reg no: 84 KB 78. 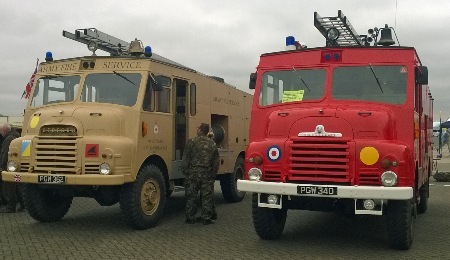 In the early 1960s both the Royal Marines and the Army required a vehicle that could be carried by air. They had taken delivery of the Westland Wessex helicopter, which could carry an 1140 kg (2500 lb) load slung beneath. 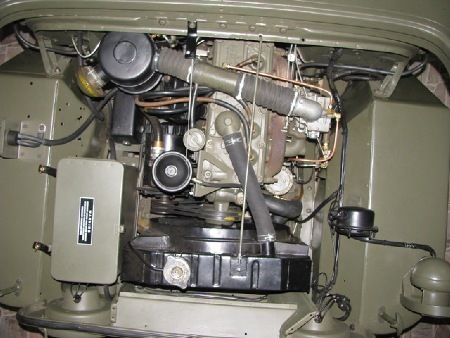 The smallest Land Rover available at the time was a Series IIA 88 inch wheelbase, which was too heavy. A new modification to the basic Series IIA was devised by making many body components easily detachable and removing many non-essential items. The result was the Land Rover Half-Ton, known widely as the Lightweight or Airportable. 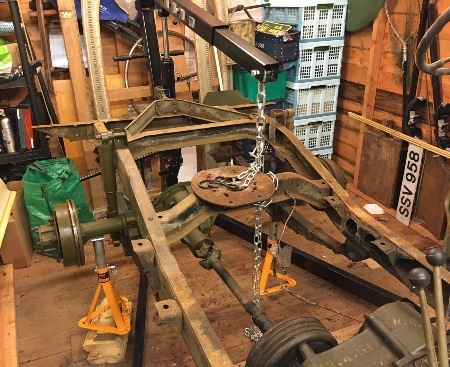 To reduce weight sufficiently for the helicopters of the day to lift them in combat conditions, the tilt (roof) and sticks, the upper parts of the body, the doors and windscreen were removed, to be refitted later (see picture). The most significant change, however, was a reduction in width by 4 inch (100 mm), by redesigning the standard Series IIA axles and fitting shorter half-shafts, which meant it would fit on a standard pallet. Complete, the Lightweight IIA weighed 2,650 lb, heavier than a standard 88 Land Rover! The term Lightweight was, therefore, confusing. The first Lightweight Series IIa production models were completed on 11 November 1968 and the Series III production started in 1972 and continued until 1984. Over 20 countries besides the British used the Lightweight. LHD models were used by the British Armed Forces in support of their NATO commitments. Many LHD models were used by the Dutch military and were predominantly fitted with diesel engines. 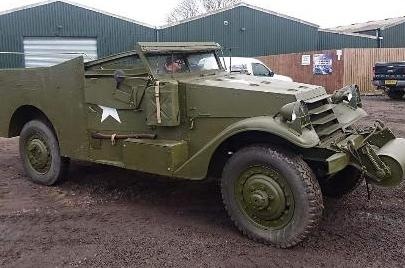 This vehicle has been slightly modified to suit today’s driving conditions with a Fairey overdrive, unleaded cylinder head, parabolic leaf springs, freewheel hubs and electronic ignition. 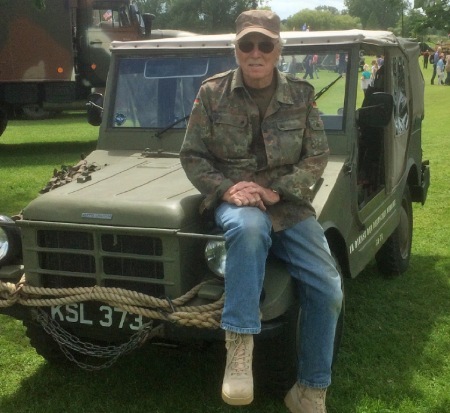 From Tony Patrick: I joined the MVT last year (2017) but unfortunately due to a long standing commitment on the first Thursday of the month I have not been able to attend the meetings, so the first photo of me with my Auto Union MUNGA is my ID! 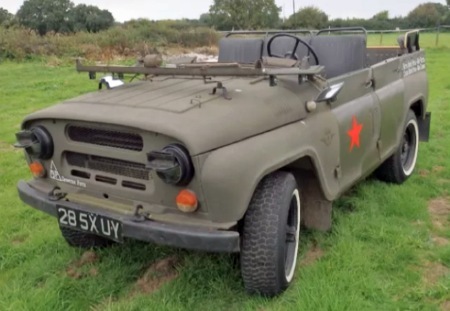 The MUNGA has now been sold and my present vehicle is a Russian UAZ 469 (second photo), ex- 9th Airborne. 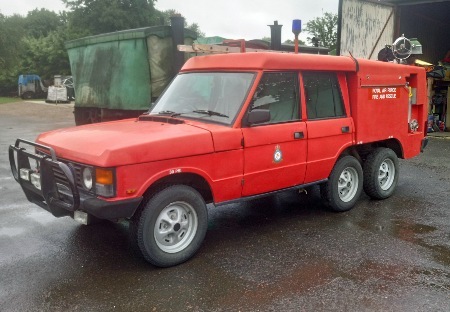 This vehicle was bought after once again giving up the search for my first two choices, being a Russian LUAZ 967 or German 181 Trekker.I'm sure I'm not on my own having problems sourcing military vehicles particularly in this country, which has prompted me to inform you of the supplier of my UAZ who I can thoroughly recommend.Ross Howard is a vehicle enthusiast who runs what I would call a hobby company Motors Through Time (not his main occupation) Rosshoward@yahoo.co.uk situated just outside Stamford. Tel: 07790 007087. 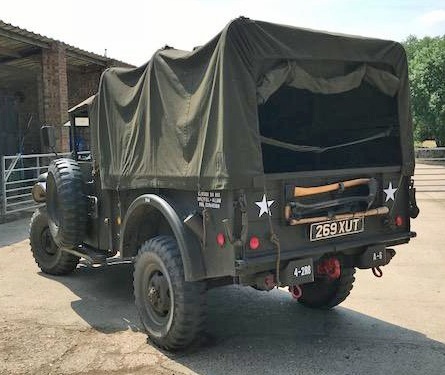 Ross is in my opinion is a very helpful genuine enthusiast who acquires classic vehicles, including military, and sells on either as found or repaired/restored to the costumer's requirement. 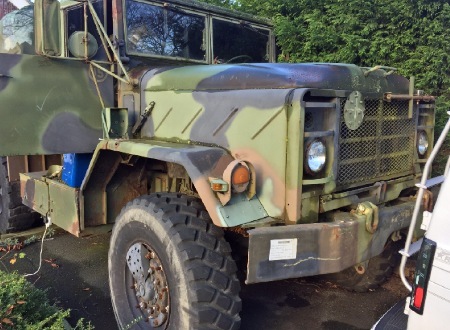 Military stock at the moment is a 1991 BMY Harsco (third photo) priced as it stands at 10k. I hope this info can be helpful to members who have access to to your information services. 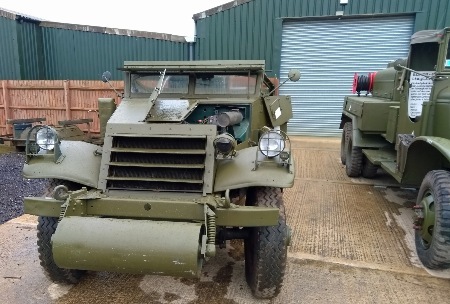 Ian Gardiner's GMC 353 was bought in November 2016 from the Cobbaton Combat Collection near Barnstable in Devon. 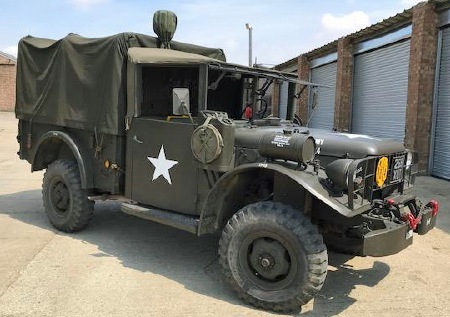 The truck was one of the vehicles used during the making of the film Fury. 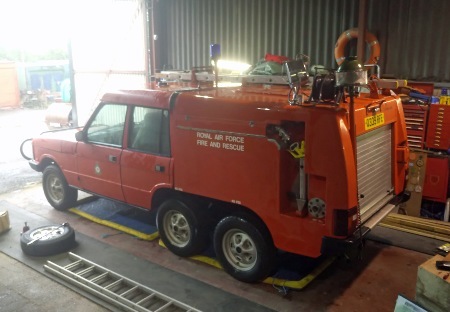 He says:"After it was delivered by a friend's low loader, I drove it for the first time and sadly found that the engine wasn’t in quite as good a condition as I thought. The head was removed to show a badly blown head gasket. 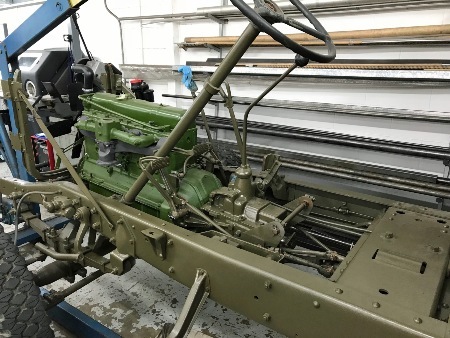 "The engine and gearbox were removed and then over the last 12 months I have rebuilt the engine, gearbox and removed all rust from the cab. 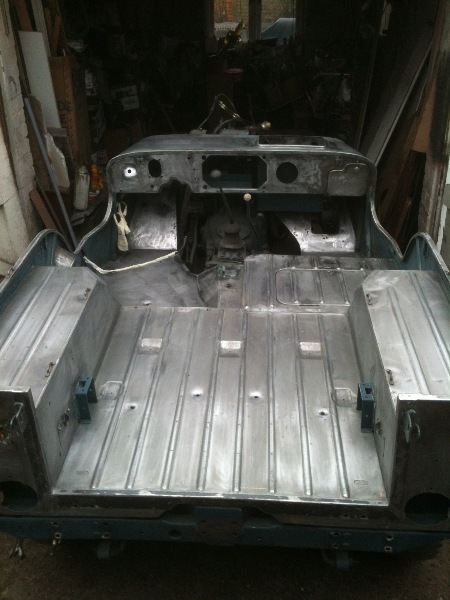 "The chassis and everything from the body forward has been stripped and painted. The painting was made particularly difficult as the whole vehicle has been sprayed with some sort of bitumen paint which had to be painstakingly scrapped off by hand. "Due to space I decided to do the front part of the truck first then next year will attempt to do the body and rear chassis after I have driven it around and attended a few shows. I am booked to take part in the Red Ball Highway Express run in June 2018 so have to pull my finger out and get it built in plenty of time. "I would like to thank the following people for their help up to this point: Neill Elliott, Ryan Gardiner, Brian Rive, Andrew Speechly and Martin Samson." 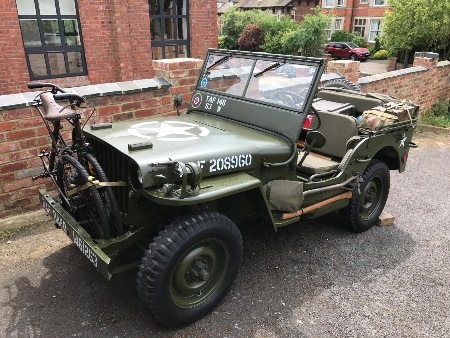 This 1944 Willys MB was bought in January 2016 after viewing in a stripped state in a shed.It was rebuilt by the Americans in Germany prior to transfer to Norway but nothing much is known about its history from then. 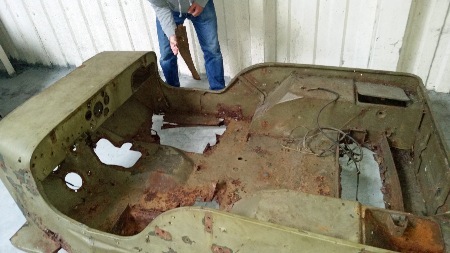 It is undergoing a 100 per cent strip and rebuild. The tub was deemed to be too far gone and reluctantly a replacement was bought. We are a little behind schedule but have most of the hard work done. FJL 233 - AKA Audrey - was manufactured on January 29, 1945, for the Royal Air Force. She now wears her original wartime hood number 208960 and postwar registration 22AA28 from when she was used with the RAF in occupied Germany. She was sold by HM Government in 1953 to William Taylor & Sons, Spalding, Lincs, as a hack to repair threshing machines etc. Later sold to Hoggs Buses, Benington, as a recovery vehicle, then bought by Paul Faunt, Boston, aged 19 for £45 in 1970. He painted her red and black and, not being able to pick up girls in her (and his mum telling him off! ), she went to A Oliver & Sons, Swinehead, from 1971 then to Larry Dench in Long Sutton in US markings. So she’d been in Lincolnshire for 60 years! She is very original, having never been fully restored and only having five owners since the King! For 2017 she has been recently restored in her original markings and made her debut at the Old Warden Fly Navy show on June 4, 2017. Her markings show her assigned to 146 Wing, 83 Group, 2 Tactical Air Force (British Air Force of Occupation) RAF Ahlorn, Lower Saxony, Germany, circa mid-1945 with 263 Squadron which flew Hawker Typhoons. The markngs are in memory of Ft Lt Doug Sturgeon, who flew with them . . . an old friend, sadly no longer with us. Her current custodian is Ben Brown, Northampton, and she is often to be found at her second home – Sywell Aviation Museum! Audrey's little friend is a 1943 BSA folding airborne bicycle, Penny. In 1941, during the Second World War, the British War Office called for a machine that weighed less than 23 pounds (this was not achieved - the final weight was about 32 pounds) and would withstand being dropped by parachute. In response, the Birmingham Small Arms Company (BSA) developed a folding bicycle small enough to be taken in small gliders or on parachute jumps from aircraft. 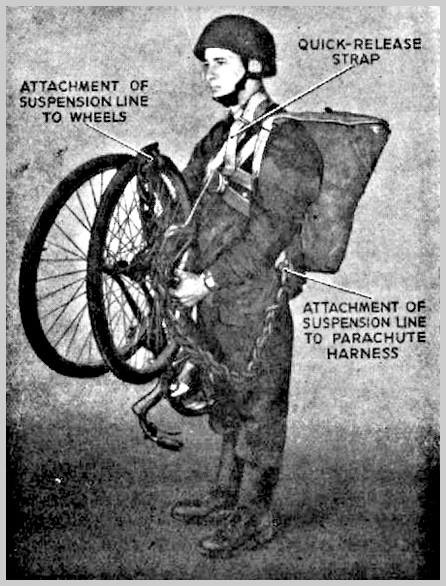 The BSA folding bicycle was rigged so that, when parachuted, the handlebars and seat were the first parts to hit the ground (as bent wheels would disable the bike). BSA abandoned the traditional diamond bicycle design as too weak for the shock and instead made an elliptical frame of twin parallel tubes, one forming the top tube and seat stays, and the other the chainstay and down tube. The hinges were in front of the bottom bracket and in the corresponding position in front of the saddle, fastened by wing nuts. The peg pedals could be pushed in to avoid snagging and further reduce the space occupied during transit. 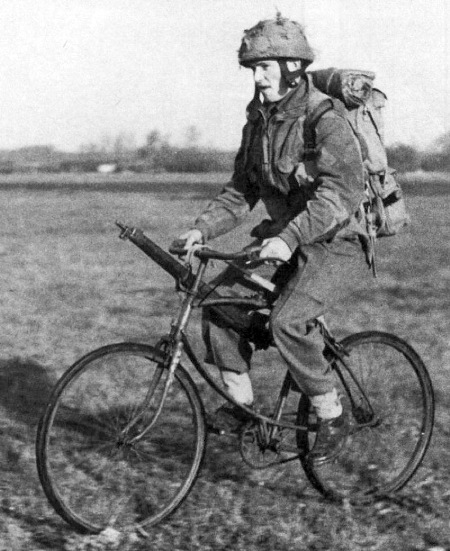 From 1942-45, the folding bicycle was used by British & Commonwealth airborne troops, Commandos, and some infantry regiments; some were used on the D-Day landings and at the Battle of Arnhem. About 60,000 were made. 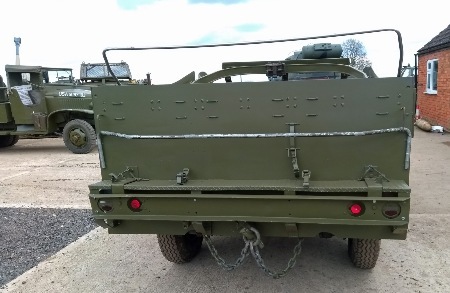 Many were "acquired" by other units and strapped to Jeeps, tanks and carried in aircraft as a useful, compact runabout, especially on spacious RAF airfields. This example was purchased in the 1970s by an engineering apprentice for £4. On his first day at work his colleagues undid the wingnuts causing the bike to collapse on his way home and he didn’t ride it again! It remained in a barn until 2017 when it was acquired by its present owner, Ben Brown, Northampton. This little Jeep is half the size of a real one . . . just imagine it twice as long, twice as wide etc! It was scratch built at Newport Pagnell, Bucks, in 1991 by Dennis Reyland for his grandchildren. 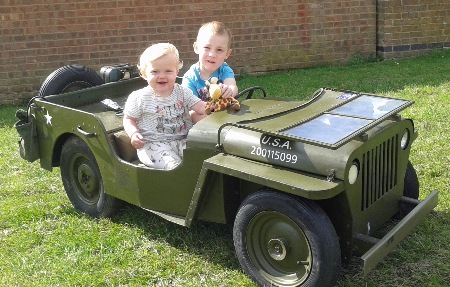 They have now grown too big for it, but the great-grandchildren now love it. 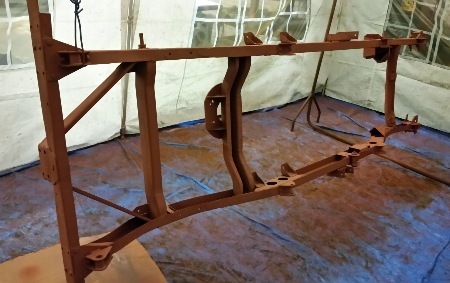 Chassis: Mainly Dexion L-section. Body: Mild steel and plywood. Motor: 24 volt from a mobility scooter. Front wheels: From a wheelbarrow or two. Rear wheels: From a Vespa scooter. The MT350E is manufactured by Harley Davidson. These bikes originated from the Italian SWM Tornado in the early 1980s. It was also developed in a military version, but the firm was in financial trouble and, in the collapse, the design went to Armstrong-CCM. In 1987, Armstrong's military motorcycle business was sold to H-D and the MT350E is a development of the Armstrong MT500 with a smaller capacity engine, electric start and disc brakes. It appeared in 1993 and continued until 2000. The carrier at the back takes an SA-80 rifle and the front panniers are for fuel cans, ammunition . . . or beer! This MT350E went into service with the Army in 1996 and carried the military registration GH 08 AA. It was released after only covering about 8,000 miles and I am its first registered civilian owner, putting it on the road in 2016. H-D was a large producer of military motorcycles in WW2 with their WLA (American Army), WLC (Canadian Army) and US (South African Army) models being the best known. Is this the longest combination of vehicle and owner in the MVT? 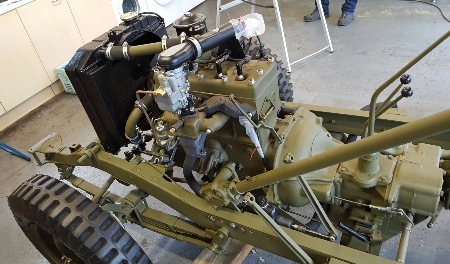 John Marchant, the grandfather of the MV preservation movement and former MVT chief judge, bought his Canadian Military Pattern Ford F60S in 1947 and has owned and used in ever since. The CMP was built in 1942 and until 1946 was in service in North West Europe. It was sold at the Bordon disposal sale with 15,210 miles on the clock. John rebuilt the engine and used it on his Northamptonshire farm until 1997, clocking up another 13,025 miles. He then fitted a new Canadian engine and rebuilt the body. 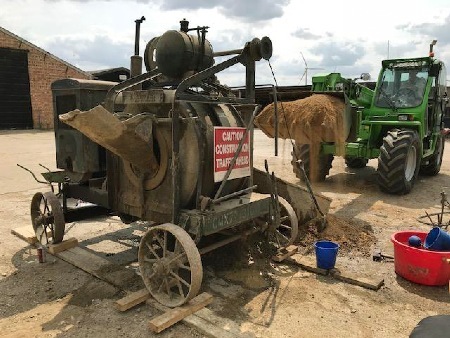 It now lives in a comfortable retirement on the farm but was brought out and given a run around the fields at the South East Midlands Area’s 2014 Crank-up Weekend on April 26-27. If readers know of a member who has kept the same vehicle from before 1947, please let the webmaster know! John Marchant (above) and the 1942 Ford of Canada CMP F60S he bought in 1947. All the markings and camouflage are exactly as they were when it served in Europe during the war. 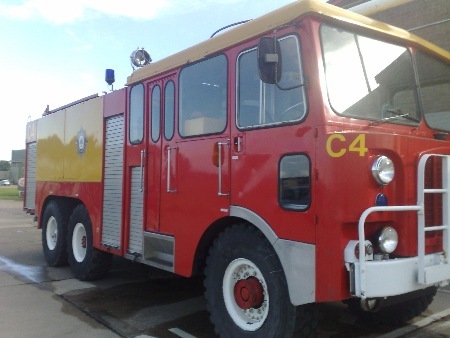 Tim Webster's fire engine started out as a Green Goddess, however due to his work with the Museum of RAF Fire Fighting at RAF Scampton, he discovered that back in 1968 in Malta the RAF purchased two Army Fire Service Goddesses, repainted them and put them back into service in one of the satellite stations to RAF Luqa. Tim Says: "I obtained the vehicle record cards from RAF Hendon and also the correct paint codes used. 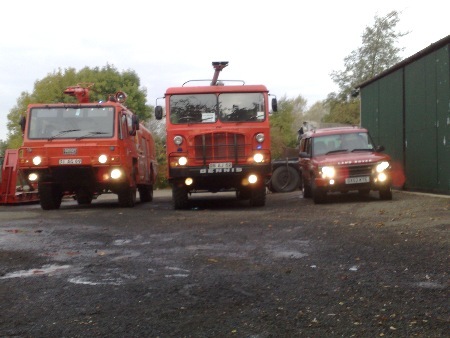 I then had to contact the RAF Historic Branch to obtain the station crest which is one the side of the vehicle. The Historic Branch informed me that I needed to contact the MoD Crown Copyright Branch to obtain permission for display. This done, it was back to the Historic Branch who then issued a disc with the crest on it. Then it was a case of taking the disc to the signwriters for reproduction. The point is I am probably one of a few people that found out you do need permission to display insignia. 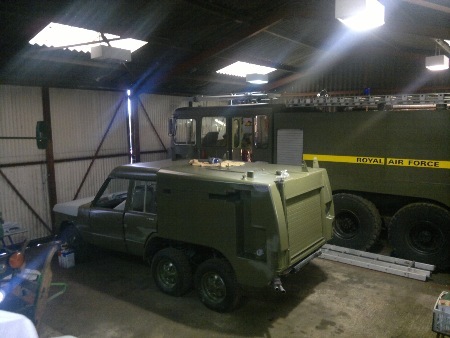 The finished product is now an exact copy of the vehicles used by the RAF at that time. 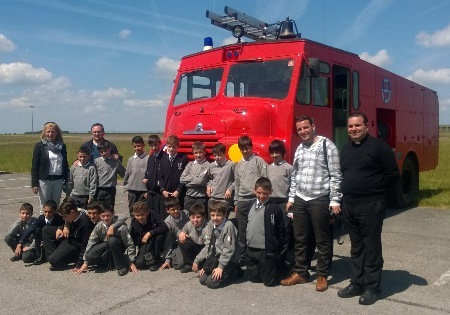 Left: A visit to RAF Scampton by a party of school children from Malta, who posed in front of Tim's vehicle. ... and finally, the rear of the year! 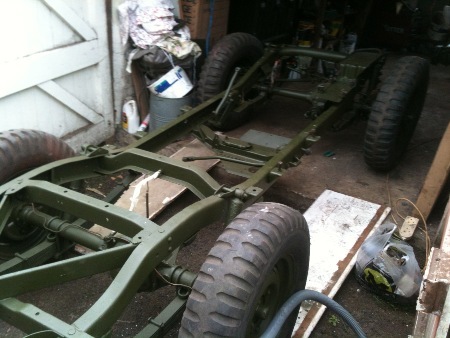 February 2013: I have been doing an M38 and here are some pictures. It was blue when I bought it 18 months ago. The paint was not good and nobody wants a blue one so I took it apart, painted in olive drab and I am now slowly rebuilding it. 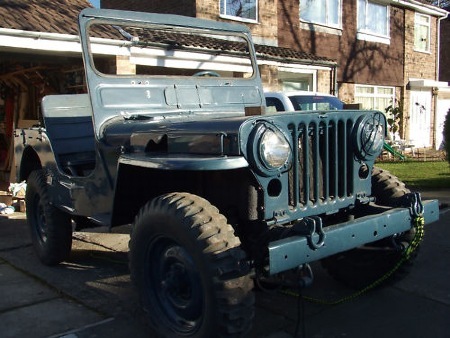 From Wikipedia: The Willys M38 United States Army jeep, replaced the World War Two models known as MB and GPW. It was a 1/4 Ton 4 × 4 Utility Truck manufactured between 1950 and 1952 with a total production of 45,473 units. 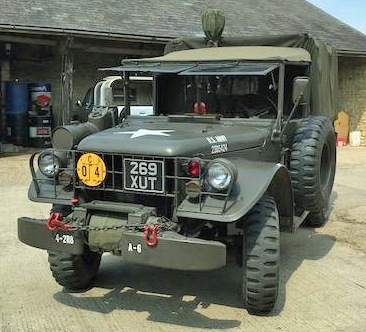 The M38 was based on the civilian model CJ3A. Willys designated it an MC. However, this version carried a beefier frame and suspension than the CJ3A. Some were assigned to the Korean theatre of operations and after that conflict was over in the mid 1950s, they were manufactured for export overseas. Is there something green lurking in your garage? Let other area members have a look and send a few words and some jpeg pictures to the webmaster (see contacts page).